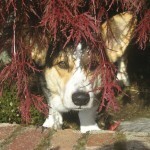 The Pacific Northwest Corgi picnic’s not until Saturday August 4th (http://pnwpicnic.com to stay on top of that). So, on Friday May 25th from noon to whenever, all Corgis, their owners and friends are invited to an informal, just for the hell of it, get together & frap-fest in our back yard. Rain or shine. It is the Seattle area and it is May, after all. No RSVP needed, just pack the Corgwn in the car and come on over. As always, this is at our home in Woodinville, WA, a suburb of Seattle. Please email me if you need directions. We have just under an acre of fenced yard for the proceedings. All are welcome – dogs, children and adults – as long as they’re well behaved and play well with others.